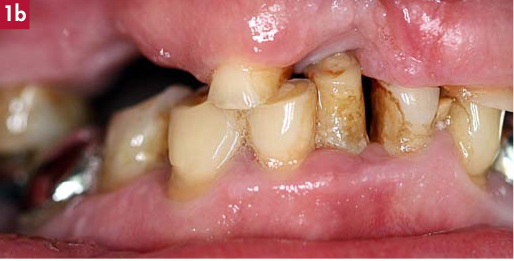 Peter is a social worker who had a serious social problem – rampant oral disease! 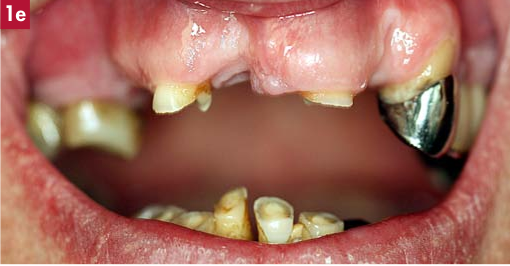 He presented as an emergency in considerable discomfort with puss oozing out from around his infected teeth. 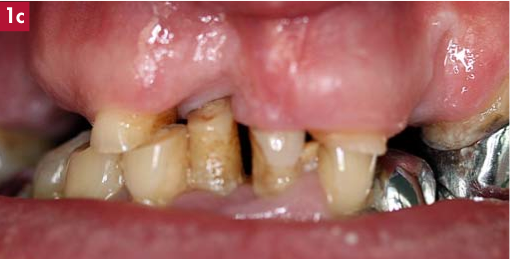 A course of antibiotics and several hygiene sessions cleared the infection but the teeth were beyond salvaging (Figs 1a-e). 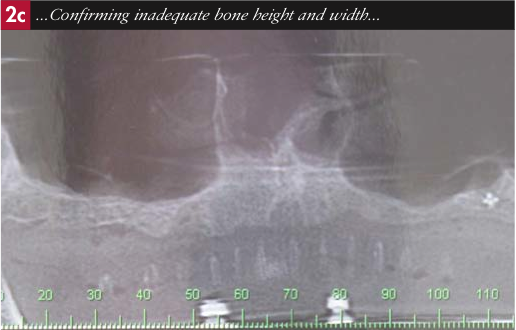 Bone loss (Fig 2a) and financial constraints dictated the subsequent treatment options. 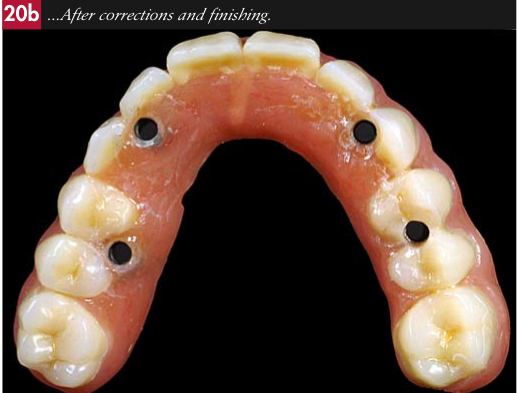 After careful consideration and discussions with Peter, it was agreed that the remaining teeth would be extracted and immediate dentures fitted, with the option of fixture placement after a period of healing. 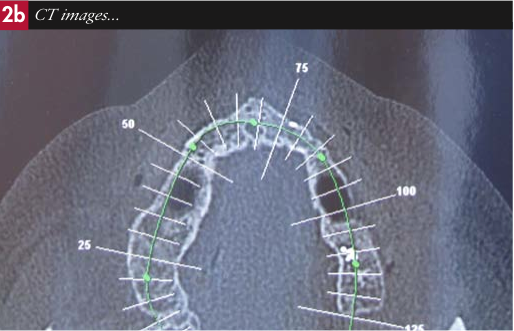 CT scanning (Figs 2b-d) showed insufficient bone in the maxilla for implant support; therefore sinus grafts became a further agreed option. 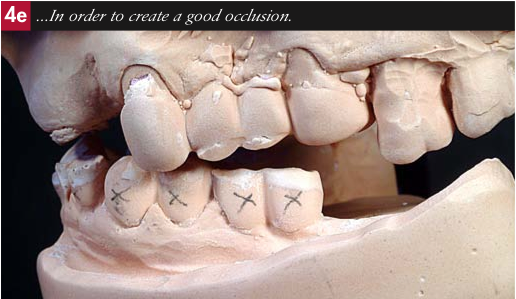 Once the infection had cleared, alginate impressions were taken together with a face bow and jaw registration. 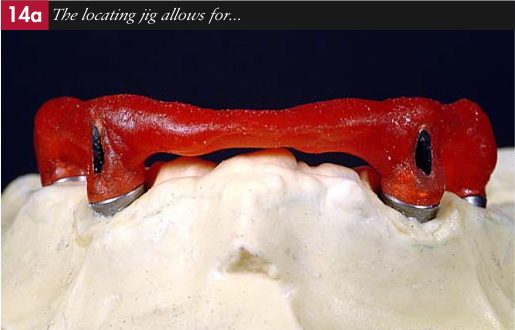 Two sets of study casts were fabricated and mounted on a semi adjustable articulator (Denar MkII) (Fig 3a-c). One set was kept for reference. 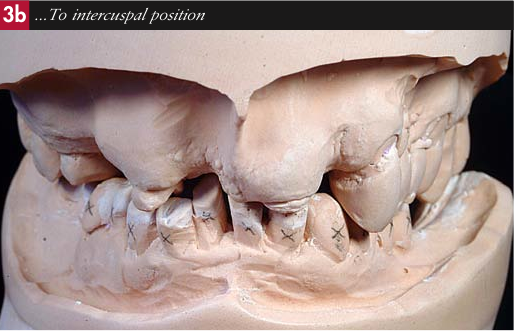 The second set of study casts was mounted using a 1.5mm spacer of wax between the mounting plates and the articulator. This was done to open the vertical dimension uniformly. 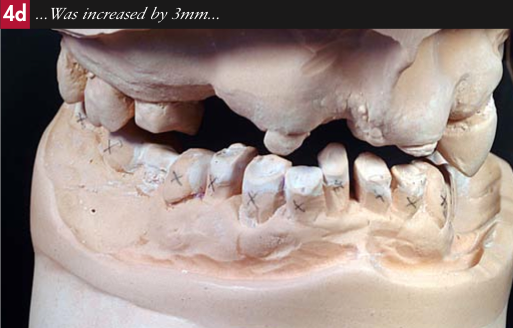 By removing the wax and fully seating the mounting plates once the casts had been mounted and tidied, the vertical dimension was increased by 3mm (Figs 4a-e). 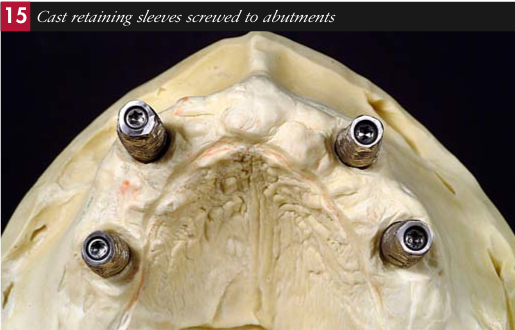 The remaining teeth were cut off the second set of casts and a set of selected stock teeth were set up to the edentulous arches and processed (Fig 5a-h), to provide full upper and lower immediate dentures (Fig 6). 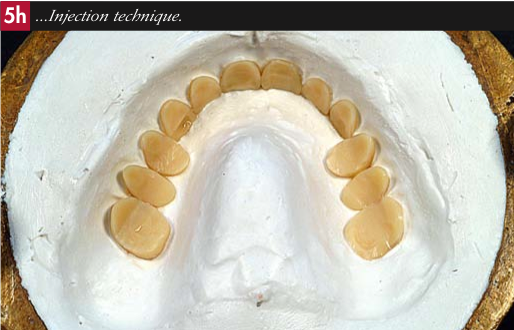 The remaining teeth were extracted and the immediate dentures fitted with a soft conditioning liner to assist healing (Fig 7). 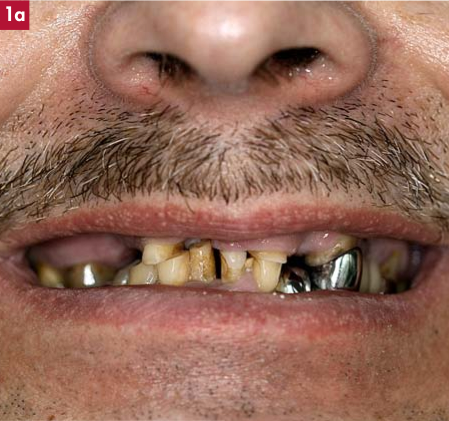 After a period of healing two implants (Straumann) were placed in the canine region of Peter’s mandibular arch. 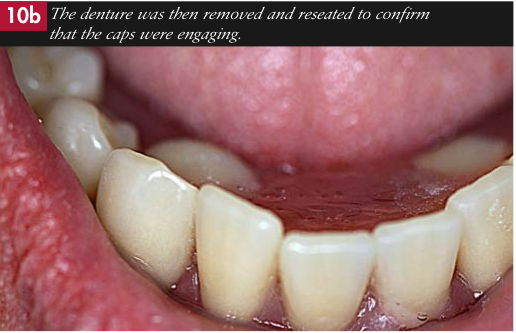 Healing caps were placed and the implants left to integrate. 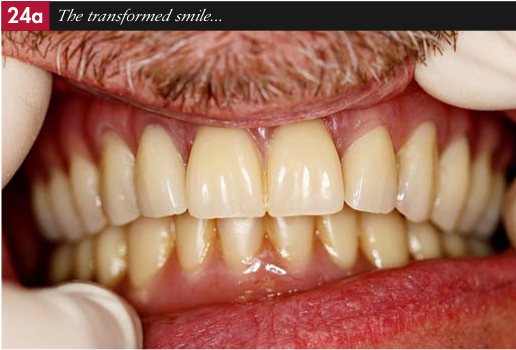 The denture was modified and relined to accommodate healing. After three months the implants were uncovered. 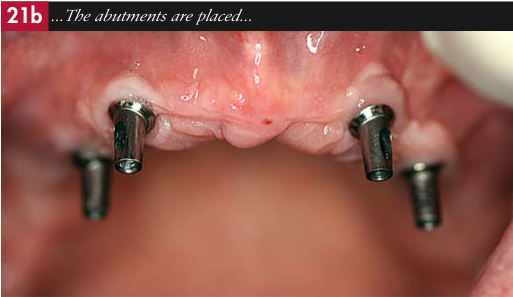 Ball attachments (Ball Anchor – Straumann) were screwed to the head of the fixtures (Fig 8) and the existing denture modified to accommodate the female component of the attachments. 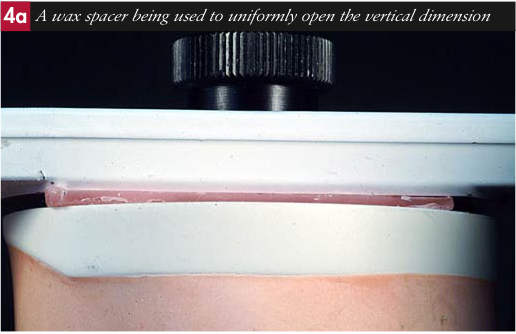 The female retaining caps were placed on the ball attachments (Fig 9). 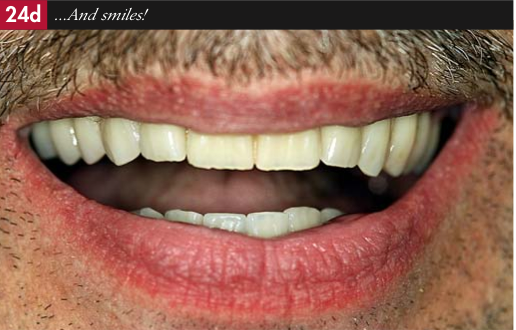 The denture was tried in to check that it was seating passively. 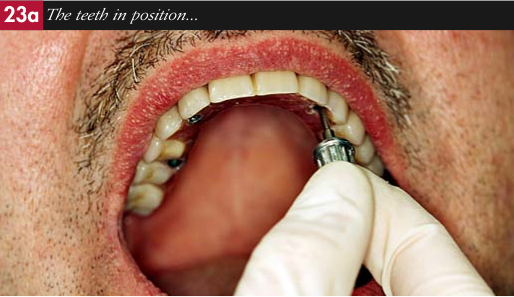 Minor adjustments were made to ensure that the denture did not catch on the attachments. Undercut spaces below the retaining caps were blocked out with soft wax to prevent the denture locking onto the attachments. 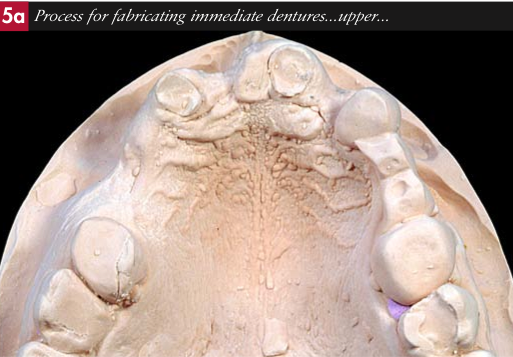 With the denture maximally seated and held in place under hand pressure, the female caps were attached by beading on tooth coloured autopolymerising resin (Duralay-Reliance Inc), (Figs10a-b). 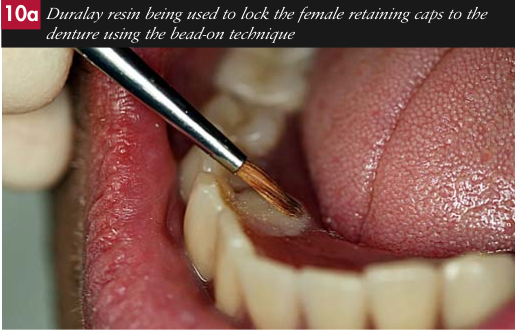 Once the resin had set, the denture was removed and then reseated to confirm that the caps were engaging. 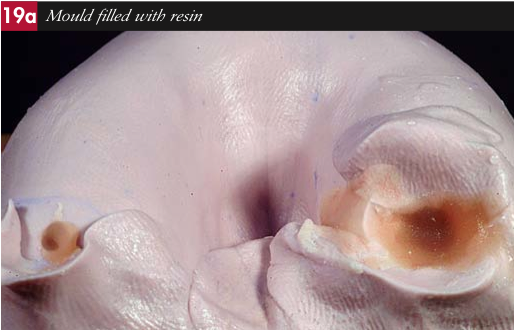 Out of the mouth, pink autopolymerising resin was added to the denture and polished to ensure the attachments were fully secured and the internal and external contour of the denture was regained and smooth. 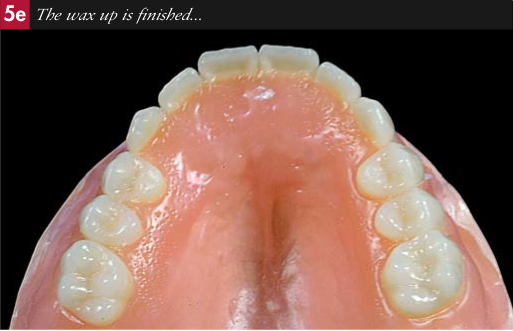 Seating was once again checked and the denture finally polished. 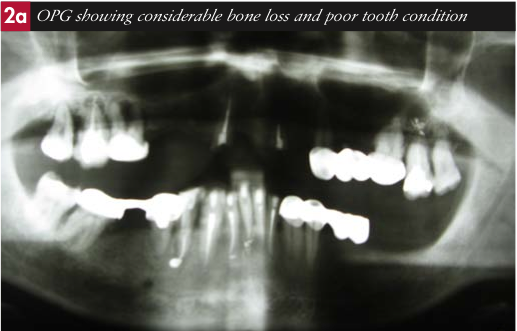 The mandibular denture was now secure and stable but could also be removed for cleaning. 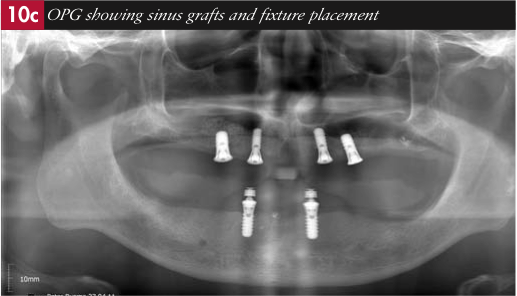 Once finances permitted, sinus grafts were carried out and four implants (Straumann) were placed in the maxillary arch (Fig. 10c). 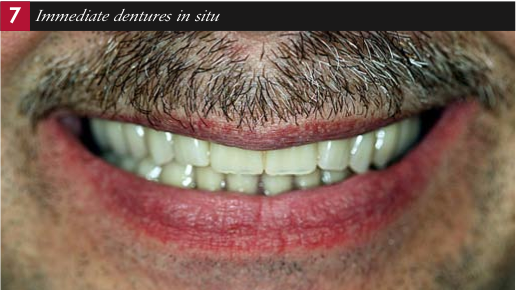 Peter was very accommodating and went without his denture during the initial healing period. 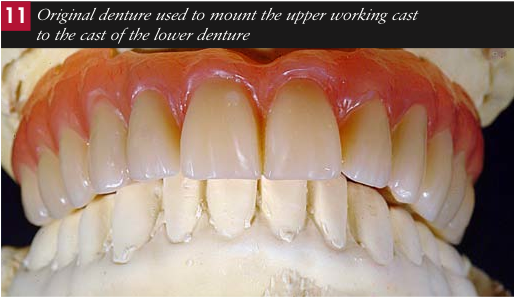 During this period the denture was modified and relined to accommodate maturation of the bone and integration of the fixtures. 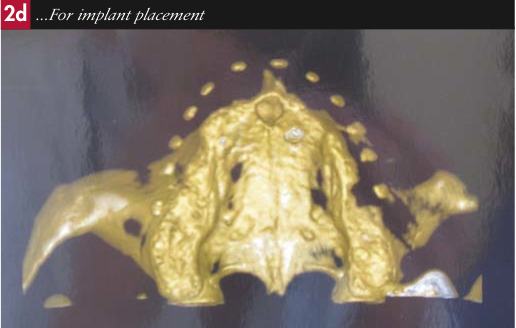 After six months the implants were uncovered and a fixture head impression taken. 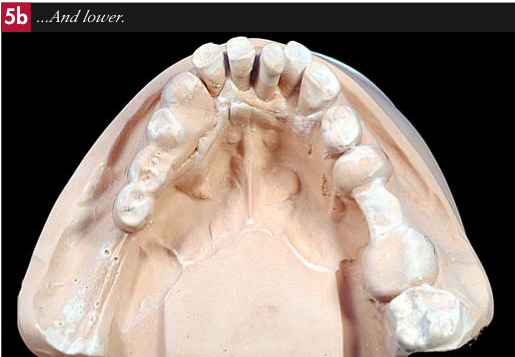 An alginate impression of the lower denture was also taken. 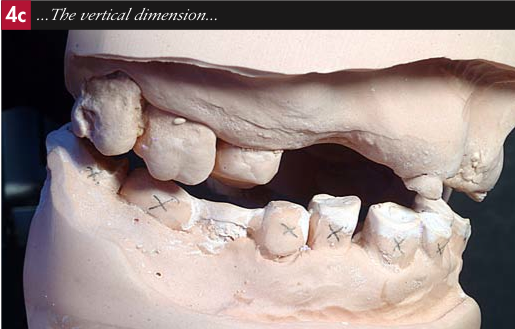 A working cast of the upper arch and study cast of the lower denture were fabricated. 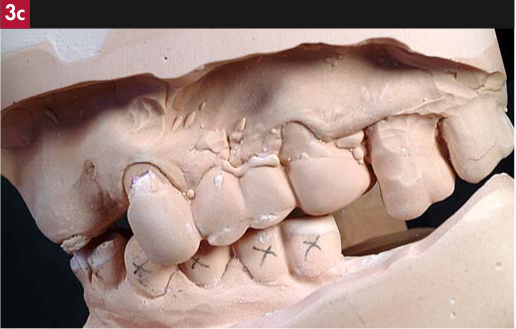 The upper denture was located on the working cast and used as a jaw registration to mount the casts (Fig. 11). 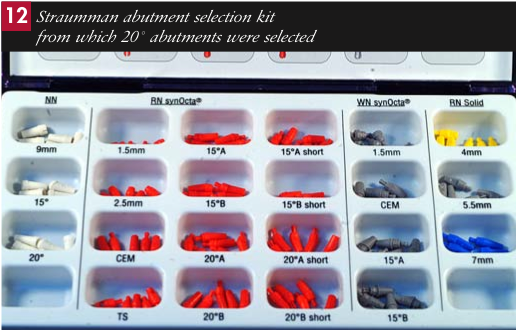 Appropriate abutments were selected using the abutment selection kit (Straumann), (Fig.12). 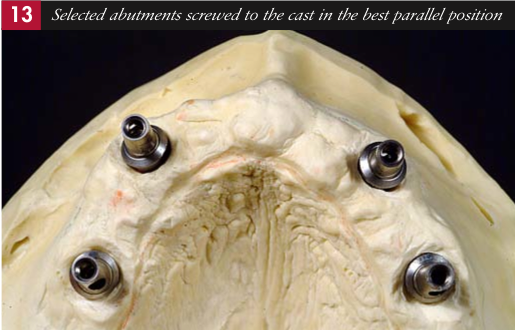 The selected abutments were screwed to the cast, ensuring they were parallel to each other (Fig. 13), and a locating jig fabricated (GC Resin), (Figs.14a-b). 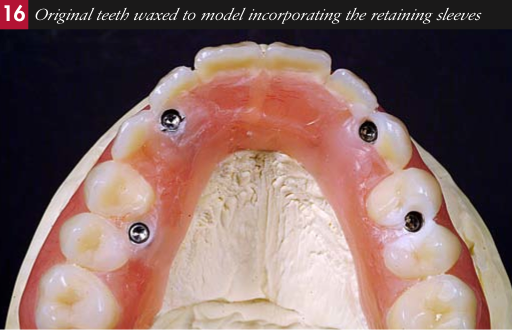 Screw retained sleeves were waxed and cast to fit over the abutments using pre-formed plastic countersinks. 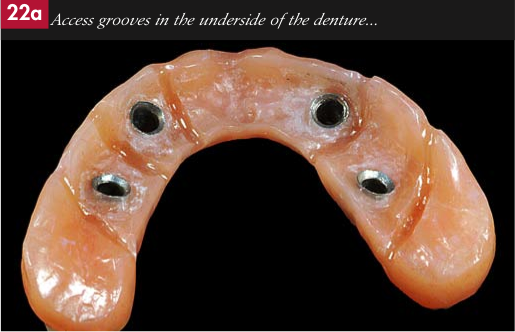 The outer surfaces of the sleeves were roughened and undercut to assist retention to the denture (Fig. 15). 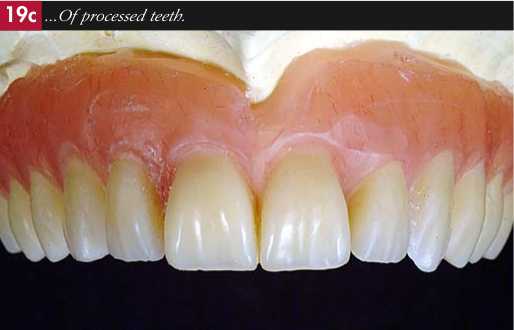 The bulk of the pink plastic was removed from the original denture, keeping the buccal gum work and ensuring a passive space to accommodate the sleeves. 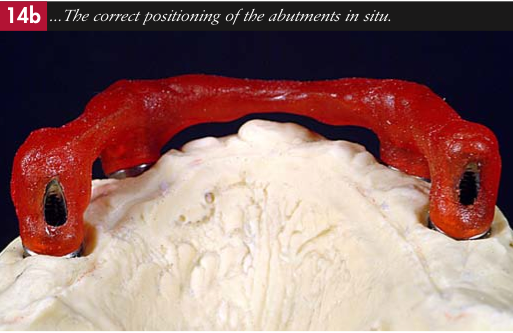 A silicone index (Lab Putty-Coltene) fabricated prior to modifying the denture was used to locate the residual arch of denture teeth to the working cast. 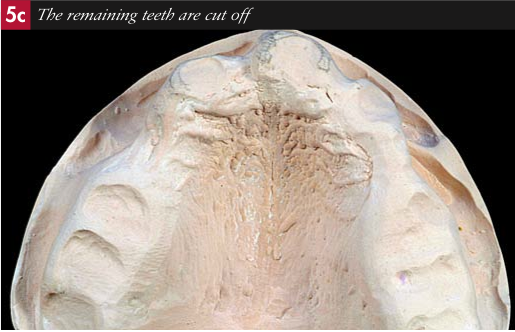 The teeth were then waxed to the cast and around the screw retained sleeves (Fig. 16). 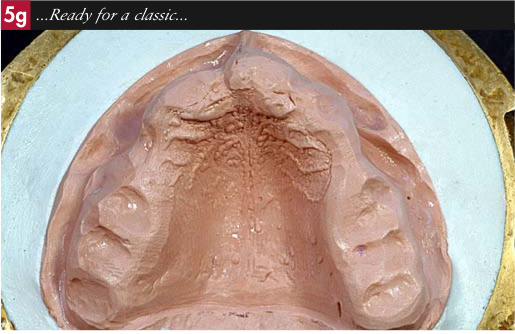 Locating lugs were cut into the working cast and a silicone mould fabricated over the waxed up teeth to the working cast.The mould was removed and entry and exit openings drilled. 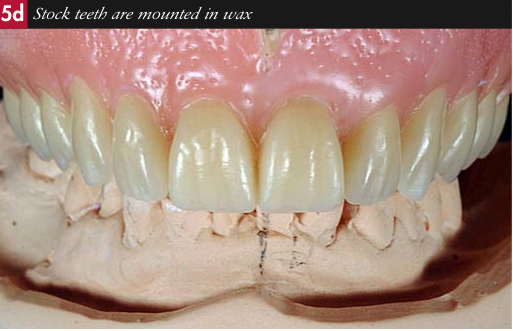 The wax was boiled off the teeth and cast. The teeth were seated in the mould and the screw heads in the sleeves sealed over with wax to prevent acrylic entering the screw holes. 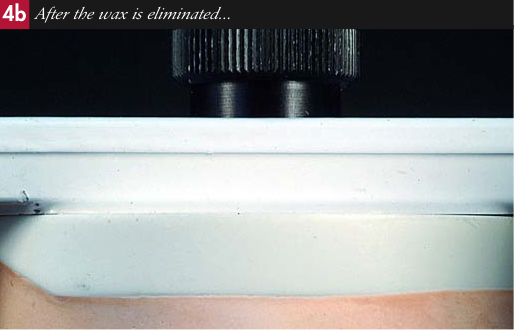 Undercuts around the base of the abutments were also blocked out with wax (Fig. 17). 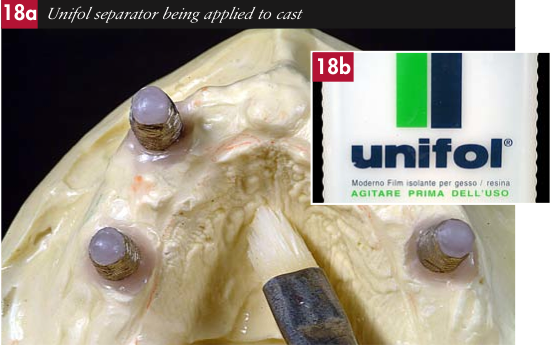 Separator (Unifol) was applied to the cast (Figs. 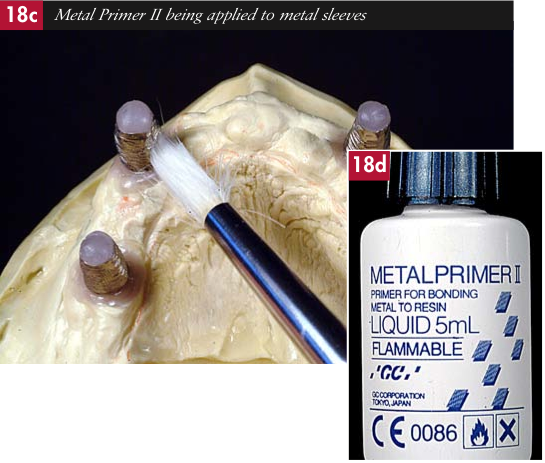 18a-b) Monomer was painted onto the old acrylic to condition it, and a bonding agent (Metal Primer II-GC) applied to the metal sleeves (Figs. 18c-d). 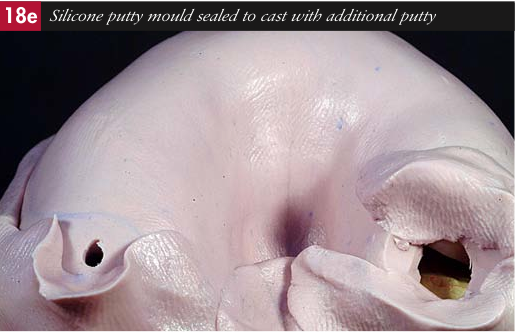 Silicone putty was then used to seal the mould to the cast (Fig. 18e). A very runny mix of autopolymerising acrylic resin (Palapress-Heraeus Kulzer) was poured until it filled the mould and then cured under 2 bar pressure in water at 55 degrees centigrade for 15 minutes (Fig. 19a). The mould was removed (Figs. 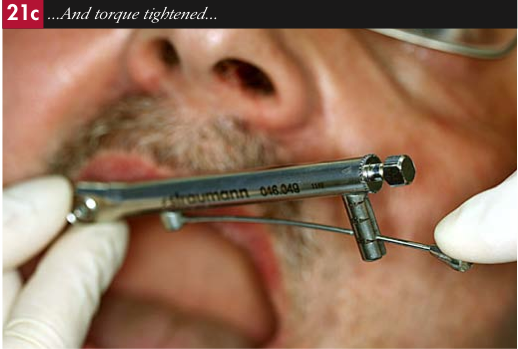 19b-c) and the bite adjusted on the articulator. 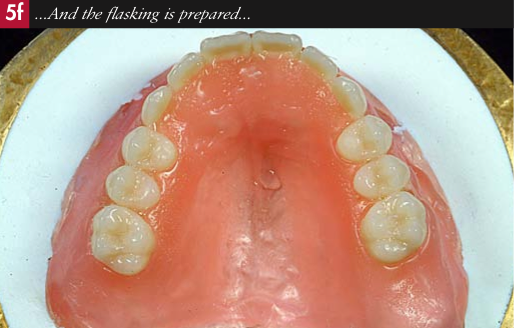 The processed teeth were unscrewed from the cast, trimmed and polished (Figs. 20a-b). 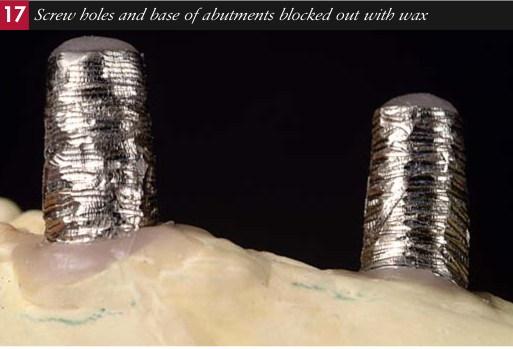 The healing caps were removed and the abutments located using the jig, screwed into place and torque tightened to 25Ncm (Figs. 21a-d). 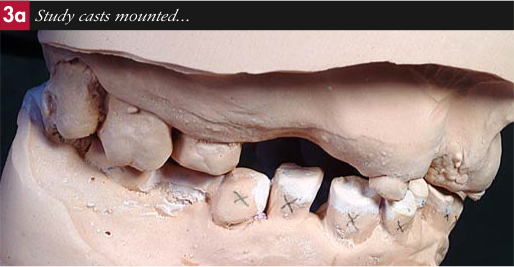 The teeth were located over the abutments and the bite checked and adjusted using marking tape. 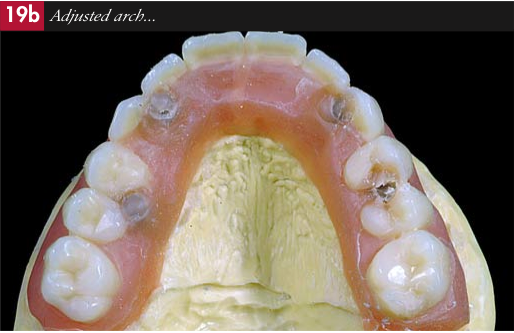 Relief grooves were cut into the undersurface of the beam to accommodate the use of superfloss for cleaning (Figs. 22a-b). 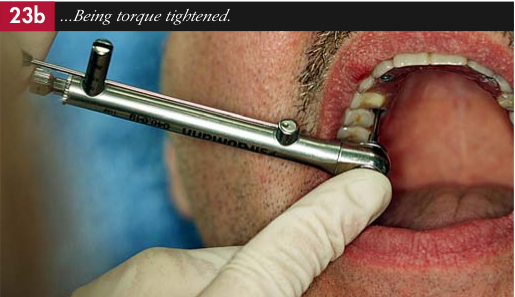 The teeth were screwed into place and initially torqued tightened to 15Ncm (Figs. 23a-b) to allow everything to settle before finally tightening them a couple of days later. 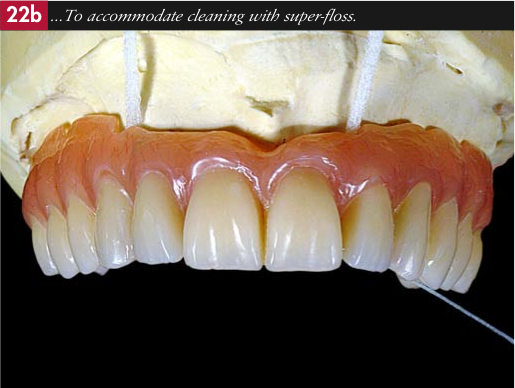 Although the upper teeth are fixed, the use of superfloss and a waterpic will maintain hygiene. 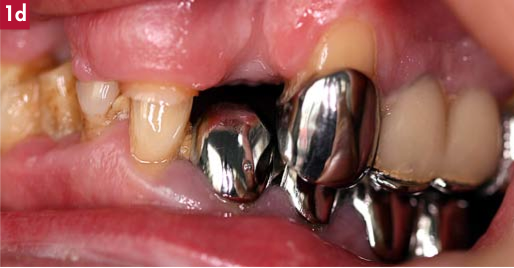 The prosthesis can also be periodically unscrewed and removed for more vigorous cleaning by the hygienist. After a lengthy course of treatment primarily dictated by financial constraints, Peter is at long last feeling much more sociable and is now a social worker with a big smile to go with his big heart!